When I went vegan, I missed cheese, but I was happy to find so many vegan cheeses that didn’t taste like plastic. Then I met and worked with Miyoko Schinner, the culinary genius who makes vegan cheese that is on par with dairy cheese. Schinner is a true chef in every sense of the word, and when I was lucky enough to eat a six-course meal by Schinner, I thought there was nothing quite like her cheese. Lucky for us, her cookbook Artisan Vegan Cheese makes it easy for anyone to make their own recreations at home. The key to Schinner’s success with replicating the flavors of dairy cheese is using the same culturing techniques used to make cheese. I love the process of making my own cheese. Artisan Vegan Cheese is a must-have for former cheese lovers! Her recipes require patience and time, but no recipe is difficult. You simply need time to culture and dry the cheeses. I buy my cashews in bulk and rejuvelac (a probiotic) at Whole Foods, instead of making my own rejuvelac. I also suggest reading through her recipes, so you know how much time the cheese will take to make from start to finish. Cashew Chèvre—tastes just like goat cheese and it’s easy to customize! Fresh Mozzarella—I use it to make a delightful caprese salad with heirloom tomatoes and fresh basil. Cashew Cream Cheese—the simplest recipe (just cashews, soy yogurt, and salt) and it tastes just like the original. I’m a former New Yorker and lover of bagels, so I know my cream cheese! 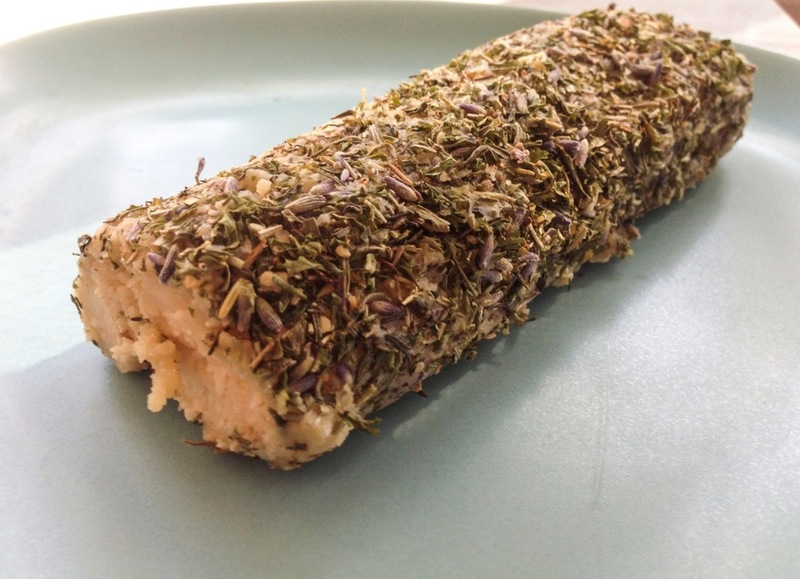 Cashew Chèvre covered in Herbes de Provence. 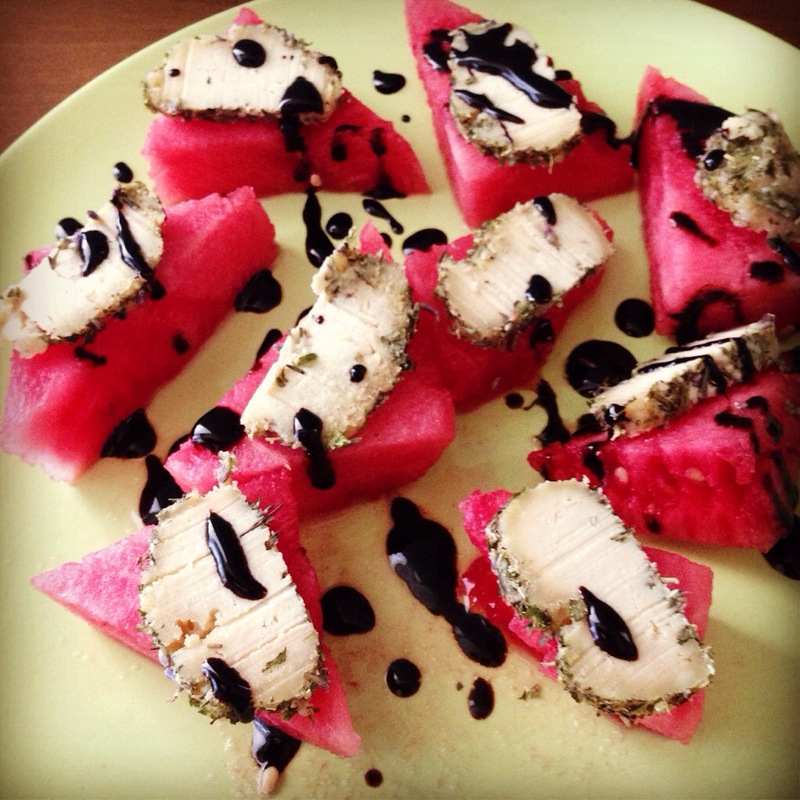 Watermelon slices topped with the Cashew Chèvre with Herbes de Provence, drizzled with a balsamic vinaigrette glaze. This salad was so refreshing and delicious! ← Grab the October/November issue of Bust magazine! PCRM is a great organization. Thanks for sharing!